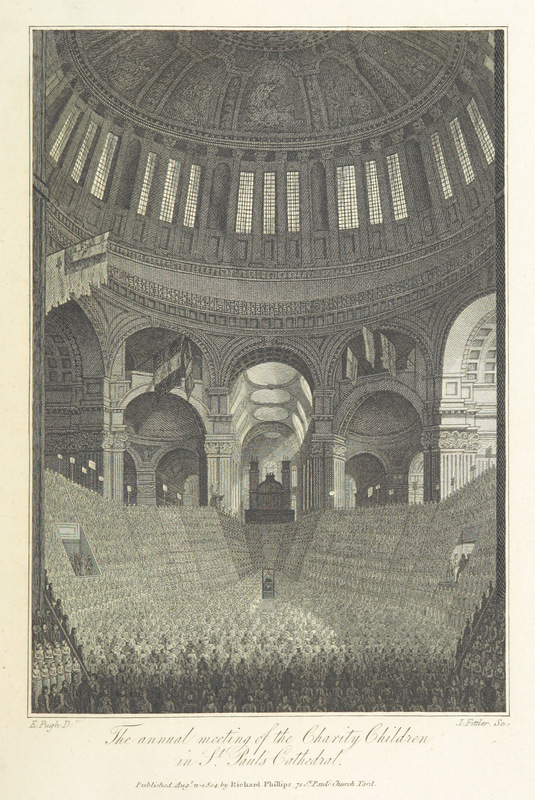 INSIDE OF ST. PAUL'S CATHEDRAL, WITH THE ANNUAL ASSEMBLAGE OF THE CHARITY CHILDREN OF THE METROPOLIS. ONCE in every year, usually in the last week in May, or the first in June, a charity sermon is preached at St. Paul's, by one of the bishops or some other dignitary of the church, in aid of the charity-schools of the several parishes in London. The Plate represents this interesting scene. Against the pillars of the great circle beneath the dome are erected temporary galleries on all the eight sides, except that next the western aisle, which is left open for spectators. In these the children are seated; the boys in the upper rows, and the girls below: they usually amount to six thousand! On the north and south sides are temporary staircases, leading into the galleries, the entrance of which will be seen on the right and left of the Plate. The galleries are partitioned into divisions, equal to the number of the several schools; each school being distinguished by its flag, with the name of the parish, raised on a pole above the back of the scaffolding, in the manner represented in the Plate. A seat runs round the foot of the galleries, on which are placed the masters and mistresses of the several schools. The eastern half of the circle is divided into pews for the lord mayor, aldermen, and their friends, the dean and residentiaries, and other persons of distinction. Across the circle, from north to south, is left a broad path, for the stewards and others who regulate the ceremony. The remainder of the circle, and the whole of the west aisle, are occupied with rows of benches for the other parts of the congregation. A temporary pulpit is erected on the eastern side of the circle. Against the organ-loft is a temporary gallery for the choristers of the cathedral, who assist in the service: the children also join in the chanting, following their singing-master, who is elevated on a seat above the galleries to the left of the organ. Persons are admitted to this service only by tickets; and a collection is made, which usually produces from three to four hundred pounds. The Plate represents part of the inside of the dome of St. Paul's. The whispering gallery is within the iron-railing which runs round the dome immediately above the arches. The view of the choir, as it is seen behind the organ-gallery, gives an accurate idea of the aisles of this church. Above the windows are the paintings of Sir James Thornhill. The following are the flags seen in the Plate:—That to the left was taken from the French at Fort Bourbon, in the island of Martinique; the two next were taken in Lord Howe's victory, on the 1st of June 1794; the two most to the right of the other three were taken by Lord Duncan from the Dutch fleet, at Camperdown; and the left of the three was taken by Lord Elphinstone from the Dutch Admiral, Lucas, at the Cape of Good Hope.